RTH 5.35 – This brand new model by Magni TH intends to offer the highest working height among the rotating telescopic handlers, reaching a maximum height of 35 meters with a load capacity of 2.2 tons. Despite its massive performances, it remains a very compact machine being built on a chassis just 15 cm longer then the one of the RTH 5.30; which has been reinforced to sustain the machine in all the strains due to the lifting process. The cabin reflects all the high standards of all our range, but has been moved forward( on the front left corner) in order to guarantee an optimal visibility during the driving of the machine. What is really innovative and original is the boom construction; it is made of 6 sections and 2 extension cylinders, both positioned on the outer side of the boom leaving more free space on the inside for hoses and pipes. This solution is optimal hoses are protected inside the boom and are not exposed to hits or accidental damages. The internal hoses are of two types, six-glued hoses and four-glued hoses which eliminates the problem of friction in their movements or to the problem of twisting. The boom is very innovative because it is the software that controls the 5th section. This system is thought to have the best load chart with both the horizontal and the vertical extension, and provides the extension of the 5th only when it is necessary and in a proportional manner to the boom angle. 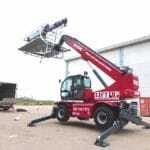 The perforated structure of the boom’s element contributes to the performance of the machine in terms of capacity and allows to reach 2200 kg of lifting capacity at the maximum height. This machine is equipped with a Mercedes Engine Euro 4 final with 170 kW/ 231 hp, one Bosch Rexroth hydrostatic pump (125 cc) and a Bosch Rexroth hydrostatic motor( 150 cc). The hydraulic circuit mounts a pump of 60 cc and a distributor Sauer Danfoss with 7 elements and security level SIL 2; it is also compatible with a fixed winch on the lower end of the boom.